Turns out Nintendo wasn't lying: The 3DS will feature downloadable games from classic non-Nintendo gaming systems. 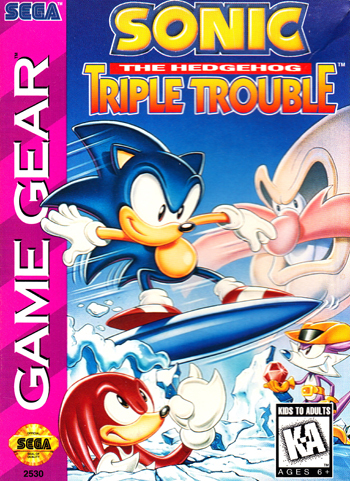 At least, that's the conclusion to be drawn from a recent ESRB listing that includes Game Gear classics Shinobi and Sonic Triple Trouble. Both titles are rated "E for Everyone," and both are listed as available for "Game Gear, Nintendo 3DS." Barring baffling Nintendo shenanigans, this means the 3DS' eShop (like the Wii's Virtual Console service) is about to start hosting titles from Sega hardware. What the ESRB listing doesn't mention however, is when these titles might appear, or if the Game Gear is the sole non-Nintendo console that we can expect to see on the handheld. The Wii Virtual Console eventually featured games from the Neo Geo and TurboGrafx-16 as well as Sega's myriad hardware iterations, so it would make sense to see similar offerings on the 3DS, but this is a Nintendo initiative, so who knows? At best we can keep our fingers crossed, hoping against hope for some sweet, portable Air Zonk action. So, y'know, basically just keep doing what you've been doing.